Renault has introduced a new top-of-the-range trim level to its Captur compact-crossover - the ‘Signature’. Renault Ireland say that this high specification model builds on the Intense version and adds numerous extras, including some exclusive ones, as standard. Order books have now opened with prices for Captur Signature starting from €22,190. On the exterior, 17-inch Explore alloy wheels with black inserts and chrome exterior details on the side strips, boot lid, front grille, and fog lights set the Signature trim level apart. A two-tone exterior finish is standard whilst a distinctive optional flame red metallic paint with black roof is available. A choice of three other metallic and two solid colours is also available. Inside, the Captur Signature receives upgrades in the form of part-leather upholstery, Signature door sill plates and mats, and the Red Touch Pack - adding bright red detail to the centre console, speakers, and air vents. In terms of technology, Renault claims that the Captur Signature represents a step up from the Intense MediaNav trim. The R-Link infotainment system includes a seven-inch touchscreen, satellite navigation (with EU mapping and TomTom LIVE traffic services ), USB connectivity, and an uprated 4 x 35W Arkamys radio with 3D sound. A rear parking camera combines with the rear parking sensors to make parking effortless. The Grip Xtend advanced traction control system provides maximum grip on the road in difficult driving conditions through the use of a simple thumbwheel on the centre console. The Signature version retains the comprehensive specification from the rest of the Captur range with equipment such as cruise control, automatic climate control, Bluetooth connectivity, and LED daytime running lights. 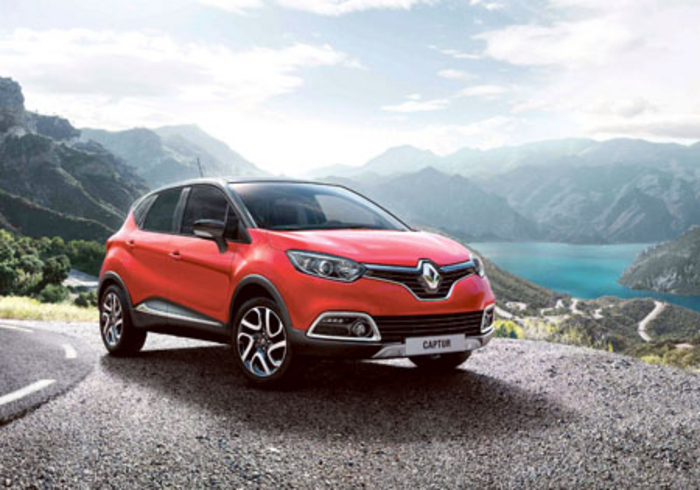 The Captur Signature is available with a choice of a petrol or diesel Stop & Start engines. The petrol line-up consists of a 0.9-litre TCe 90, mated to a five-speed manual transmission. In terms of diesel, the 1.5-litre dCi 90 is available as both a manual and an automatic. On the Energy dCi 90 version, emissions are as low as 98g/km whilst fuel economy on the official combined cycle is 3.8 l/100km - meaning low running costs. The Renault Captur range, which is priced from €19,590, has proved popular with Irish motorists since its launch in 2013 with over 1,100 units of the compact-crossovers sold this year. And Renault reminds us that all new Capturs, as well as all their new cars, come with a five year warranty as standard.